It all began when Mike Miller, a third-generation inventor, cut his hand on an exposed nail head on a dock. This experience turned his inventors mind to solving the problem of nail pops. In doing so, he asked the question, "could the strength of wooden golf tees be combined with a stepped-design to solve the problem?" 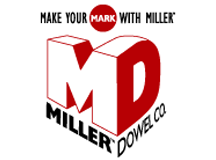 Indeed they could and in 2001, the Miller Dowel Company was founded after Mike Miller was awarded a patent for his design of the Miller Dowel. At the 2002 International Woodworking Fair, the company introduced the first Miller Dowel and TruFit Drill Bit and the business has been growing ever since. The Miller Dowel system combines time-honored appearance and the advantages of natural methods of joinery with the speed and convenience of metal fasteners. This clampless system is a logical alternative to mortise and tenon, blind dowels, biscuits, and other methods of natural joinery that are more time-consuming and require additional expenses in tooling. Because a Miller Dowel is made from solid hardwood, it is inherently flexible, durable, and non-corrosive. Also, because it enters from the outside of a joint, it offers the same advantages as nails and screws. The Miller Dowel Company currently sells three sizes of dowels and companion drill bits: the 1X, 2X and Mini-X. These products are available separately or as a kit that includes 50 dowels and the companion drill bit. Miller Dowels are sold through a number of national and international retailers. Miller Dowel Joinery provides a simpler method of construction. If you can drill a hole and pound a nail, you can use Miller Dowels. It is fast, simple, economical, strong, and durable.